Let’s see. We’ve got two corrupt individuals, here, but two very different treatments under the law. One of the above did everything she was asked to do and more, kept her mouth shut and destroyed evidence. She gets a gold star. The other person did bad. He was critical of the administration’s negotiations with Iran and embarrassed the president. He gets indicted. As Ace says, The masks are all off now. This is the the quasi fascist state of law enforcement in America today where the DOJ selectively and capriciously decides to enforce the law to the benefit of some and the detriment of others – depending on political considerations. Posted in Commies, Contempt, Corruption, COVER-UP, Dems, Holder, Iran, ObamaFAIL. Judge Andrew Napolitano and Congressman Trey Gowdy both appeared on The Kelly File Monday night to talk about Hillary Clinton’s email scandal. Megyn Kelly asked Napolitano to weigh in on Obama’s take on the controversy. “I’m glad that Hillary’s instructed that those emails that had to do with official business need to be disclosed,” Obama told CBS News’ Bill Plante over the weekend. “Apparently the president has the same misunderstanding of federal law that his former secretary of state does,” Napolitano quipped. He went on to explain the federal statute that says documents and records by high-ranking officials belong to the government. “A former official can ask the government for personal documents back, but Clinton did the opposite,” Napolitano said. “She retained and concealed 100 percent of the documents with which she dealt while she was secretary of state in 48 months. She decided what was governmental and kept what she didn’t want to reveal,” he continued. Kelly announced that Hillary will be addressing the email scandal within the next 48 hours. The forum has yet to be disclosed, but it is a safe bet that it will be hermetically sealed event with only friendly reporters allowed in with pre-approved questions. Congressman Trey Gowdy, Chairman of the House Select Committee on Benghazi came on next to talk about the State Department’s unimpressive reaction to HillaryGate. Gowdy then went on to describe the run-around he got from State, Hillary, and her lawyer, last summer when it was first disclosed that some of her emails were on her personal account. Gowdy was stonewalled for months as he kept pressing for the rest of them. It wasn’t until the day before the NYTs story broke that he found out that she did not have an official email account. Gowdy wants a neutral arbiter – “a federal judge, archiver, or inspector general” to take charge of getting the info he seeks from her server. Hillary Clinton will hold a press conference Tuesday afternoon to address the revelation of her exclusive use of a personal email account and private server to conduct State Department business while Secretary of State. Posted in BenghaziGate, Contempt, Corruption, COVER-UP, Deesgusting, Dems, Enough!, Fox News, GWOT, Hillary!, Megyn Kelly, Regime. So it has been revealed that for the entire span of Hillary Clinton’s tenure as Sec. of State, she was using a private email account – totally against federal regulations. What the Morning Joe team failed to note, of course, is that private email improprieties appear to be an Obama administration-wide issue. And as always, the MSM was asleep at the wheel as this example of government corruption was allowed to pass by without notice. We can thank Trey Gowdy’s Select Committee on Benghazi for this new revelation. While the Hillary Clinton email fiasco is sure to be the talk of the town for the next few days, weeks, and months and may have seriously jeopardized the former SecState’s chances at becoming America’s next president, an even more important story is how the revelation that Hillary exclusively used a private, unencrypted and unsupervised email for 4 years of state-level, official business communications, emerged in the first place. The answer, shockingly, comes courtesy of a Romanian hacker who was known by the handle “Guccifer”, and who is currently serving time in a Bucharest prison for his online attacks against countless public figures including the infamous leaks of George W. Bush personal paintings. How is it possible that a Romanian convict may have helped accelerate the downfall of Warren Buffett’s presidential hopeful? According to the Smoking Gun, which first reported on this topic back in March 2013, “Guccifer” illegally accessed the AOL e-mail account of Sidney Blumenthal, who then worked as a senior White House adviser to President Bill Clinton, and later became a senior adviser to Hillary Clinton’s 2008 presidential campaign. >The State Department is stepping back from a spokeswoman’s comment last week suggesting that the agency’s ethics lawyers signed off on donations to the Clinton Foundation during Hillary Clinton’s tenure as secretary of state.Asked at a daily briefing Thursday about the foundation’s failure to submit a $500,000 donation from the country of Algeria for a conflict of interest review in 2010, State Department spokeswoman Jen Psaki told reporters that the department did such reviews whenever the non-profit founded by former President Bill Clinton sent in information about a potential gift. “We like to review — and we have reviewed every donation that was submitted,” Psaki said. However, there are no indications any Clinton Foundation donations were ever sent to the State Department for approval. Asked about Psaki’s comment, another State Department spokesperson said Monday that the reviews the agency did were of paid speeches Bill Clinton was proposing to make and business deals he wanted to enter into. From 2009 to 2012, hundreds of speech requests and a handful of consulting deals were sent to State Department lawyers for sign off. The vast majority were approved. “We received requests regarding speeches and consultancies of former President Clinton,” State spokesman Alec Gerlach said. Clarifying Psaki’s earlier comment, Gerlach said that State Department reviewed every request that came in, not every donation. Will Hillary survive these scandals? Or is the deck being cleared for the left’s latest darling Lizzie (Fauxcahontas) Warren? AoSHQ: When a Veterans Group FOIA’d Hillary’s Emails, They Specifically Asked Her to List Her Personal Email Accounts. She Didn’t. Posted in Contempt, Corruption, COVER-UP, Crime, Hillary!, Not Good. In a press conference that began with his personal introduction — “For the record, I am Eric Holder” — the exiting agency head took shots at critics who suggested that nominee Loretta Lynch was his mirror image, and those who said the Justice Department was too political. He then went on to say that those who further such claims are wrong — that their jabs are “totally inconsistent with the facts,” Mr. Holder said in an ABC News video. Mr. Holder also said with a bit of an bitter tone that former President George W. Bush’s Justice Department was the one that was truly political — and that he had been forced to clean it up when he took over as attorney general. It is the hyper-politicization of the Justice Department that has led to the mind-blowing corruption and incompetence under Holder’s watch. This is Eric Holder’s legacy and he is not happy about it. Maybe it makes him uneasy to know that he will always be remembered as the most corrupt Attorney General in our nation’s history? Too bad. He should have thought about that before he politicized his office and abandoned his oath to uphold our nation’s laws. 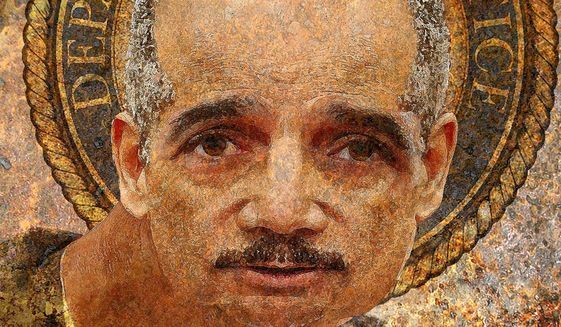 The DOJ’s Press flacks did a yeoman’s job cleaning up this man’s messes and keeping the media at bay – but history is not going to judge Eric Holder well. I hope he’s beginning to feel that. Posted in Commies, Contempt, Corruption, FAIL, HA!, Holder, Lyin' Weasels, Regime.